Hero base traits - how much bigger than regular toons? Thank you, @OneLessTitan, great work! Wow, I didn't notice that. Is he really +0% damage and has a - on his health? Or did you simply have no data for him? That's just wrong on about 7 levels of hell type wrong! I really don't understand why @Boukephalos discussion post here, unless it's just to lecture or some other self indulgence. Why ask a question that you so obviously believe you know the answer to? Not to be mean...I just don't understand...why tell a player only trying to help others that they are wrong when answering a question you asked? How could you have tested your calculations so quickly when you didn't know the difference when you asked? @ShadowaceAz Prestige = stars. It's a name for the promotion stars used in a few places, including Professor Earthtones's wiki pages. So I used it when discussing this. @CBgaming1969 Just saying I didn't understand and asking what I'd missed. When I first asked a simple question at the beginning of this thread, nobody could point me to anything like the chart (which OLT explains had not been available since the 2.9 hero boosts) and detailed explanation that OLT put in his last post, so I went and did my own calculations. When the simple percentage list was produced, I couldn't see the whole mechanism. So I kept on working on the data I had, meanwhile asked questions. Got the answer from OLT. Result. 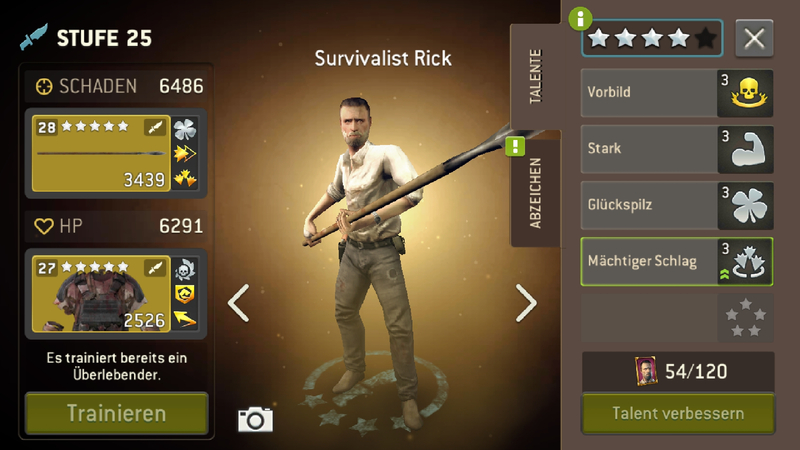 The base damage/health for ordinary survivors is calculated by taking the damage/health of a common (1-star) survivor at that level and multiplying it by a percentage increase. For heroes, you need to find the ordinary survivor percentage boost and add the hero's extra percentage boost first, then multiply the resulting figure by the common survivor's raw figure. The common survivor's figure can be found in the first column of the relevant graph on OLT's survivor base stats page. An easier way to find the result is to use the fuller graph OLT has now provided (shown again below). Ignore the hero's percentage boost, just look for the effective prestige (stars) that your hero will have for damage/health calculations at their current actual prestige, then consult the survivor base stats page. For half-prestige levels, you won't go far wrong by taking the number halfway between the stat for the two whole numbers on either side. Where the hero's resulting prestige level is higher than 10, you're going to have to make an educated guess. 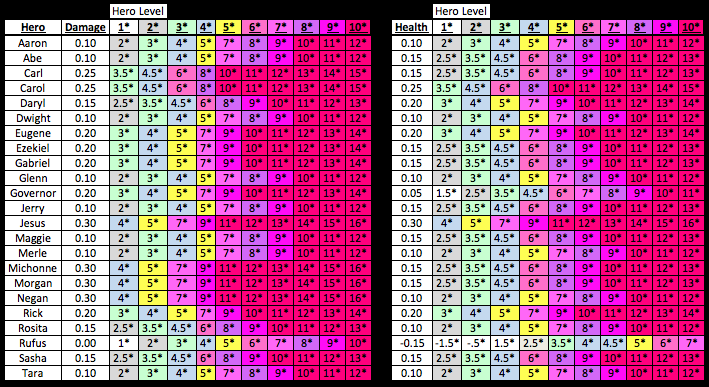 Since my basic honesty has been questioned, I'd like to say that I put a lot of work into verifying data, checking calculations and so on, to answer a question that a lot of my guildmates were also interested in, because the data for hero base stats was nowhere visible (hadn't been since before I started playing this game) and the algorithm involved not detailed at all. Even when some of the data resurfaced, it didn't seem to make sense to more than just me (as evidenced elsewhere on the forum), so after running a number of tests to check, I asked what I was missing. To be accused of being a self-glorifying liar was a surprise.